Do you know any hidden or little-known nice feature of OS X 10.7 (Lion)? It doesn't matter what it is—maybe just a short terminal command. Share your experiences on hidden OS X features here. Please post one tip per answer. Please also check to see if your answer has already been posted - duplicate answers will be deleted. To search the answers of this question you can use inquestion:18677 (or inquestion:this, directly from the question page) in addition to your search terms in the search box in the upper right hand corner of this page. Holding ⇧ and/or ⌥ while resizing a window retains the aspect ratio and/or anchors the windows center, respectively. ⌘+C to copy the file/folder (nothing new here). ⌘+⌥+V will then paste the file/folder at the new location, and delete it from the old location. To get into the contents of the user's now hidden Library folder. 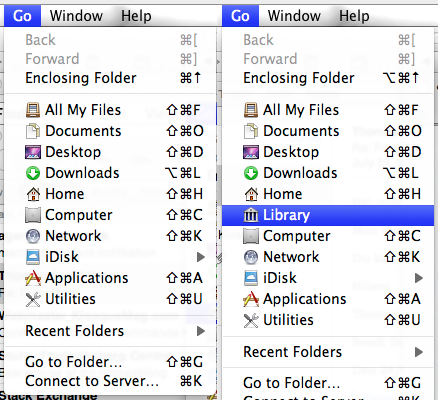 While in Finder view click on the "Go" menu item, and then click on the ⌥ key - and you'll find the Library folder. To disable the restore/resume feature on a per-app basis set the NSQuitAlwaysKeepsWindows preference for that app to false. UPDATE: this may not be working on GM. Will keep trying.. It requires restart. The Dock will disappear for a moment then reappear. Your Dock will have a Recent Applications Stack located to the left of the Trash icon. When in full screen mode in Safari, try dragging in from the sides to shrink the page width while staying in full screen mode. If you are selecting a rectangle for making a screenshot (e.g. with ⇧+⌘+4) you can press and hold space to reposition the origin point of the rectangle without resizing it. Holding ⇧ at the same time you can reposition the rectangle at along an axis. And if you hold only ⇧ you can resize the rectangle along an axis (in both cases depending on the direction you initially move the mouse). This is quite handy if you need to make precise screenshots and you don't want to spend a lot of time post processing your screenshots. The only bad thing about the selection rectangle is the fact that the borders are 2 pixels wide which makes it difficult to see the exact bounding of the rectangle. So far I have gotten this to work via Finder, Spotlight, Launchpad, and Dock icons, but not via Alfred. Get access to second by second scrubbing in Quicktime. While a video is paused in quicktime if you click and hold on the high-speed scrub bar it it will bring up a new bar that has white lines that correspond with a second by second precise scrub bar. In Mail, it used to be the case that when you clicked on a folder in the list of folders, it was very easy for your mouse (or finger) to slip a bit, causing the folder to be picked up and dropped inside a neighbouring folder. My mother, who has arthritis, and so finds accurate mouse clicking by no means easy, often lost mail folders by doing this. Lion fixes the problem: if you slip when clicking on a folder in Mail, you only select the neighbouring folder, with no harm done. It's a very subtle and impressive piece of user interface design, that most users will never notice. Always felt,it would be handy if there is a keyboard shortcut to access the application menu bar. Like in Windows, we can use (Alt+First letter of the menu) to activate that menu. Looks in Mac,there is no straight way to access application menu via shortcut. Reduce the size of the Finder side-bar font back to Snow Leopard size. To get the font in the Finder back down to Snow Leopard size, go to System preferences / General / Sidebar icon size: Small. It might be obvious for everyone else except me, but I just noticed that pressing the right arrow key in Mail.app when a collapsed thread is selected still expands the thread as it used to work in Mail in Snow Leopard and before. This is very useful when one wants to flag only one email of a long thread as it is easy to navigate to the right email and pressing ⌘+⇧+L to flag it - no need to use the mouse. And remember to kill Finder once again. When using a Magic Mouse, you can enable a gesture to start Mission Control when you two-finger double tap the mouse (just tapping the surface, no clicking needed) in System Preferences > Mouse > More Gestures (tab). If this feature is enabled, you can hover the mouse cursor over a dock icon, use the same gesture for Mission Control, but instead you will show all windows for the particular application being hovered over. EDIT: Furthermore, when you use the gesture over a dock icon, it will show the recent items (for the appropriate apps) at the bottom of the screen. Not the answer you're looking for? Browse other questions tagged lion hidden-features .